MICHAEL DOYLE spoke of his pride at being handed the captain’s armband at Pompey. Paul Cook has indicated Doyle will be his skipper for the League Two curtain-raiser against Dagenham & Redbridge next weekend. The midfielder was named captain in Saturday’s 0-0 draw at Gillingham in the wake of Paul Robinson’s departure. And he admitted he was delighted to continue in the role he has undertaken at his previous clubs. ‘It’s a special club and I’m looking forward to playing for it. ‘It’s a prestigious club to play for. ‘It’s been the same for me (being captain) at Sheffield United and Coventry and other clubs I’ve been at. 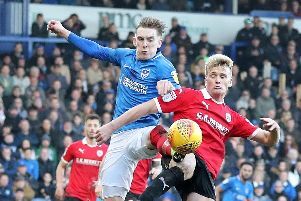 Doyle explained he feels he has important duties at Pompey, regardless of his position as skipper. The 33-year-old stated he has to be a figurehead in the dressing room as a senior figure. He feels having young team-mates with a desire to succeed this season will make that job easier. Doyle said: ‘The main thing is I will try to help other players. There are a lot of good senior players here. ‘You want to go into the dressing room, make sure things are done right and there is no messing around. ‘The one thing about the players who have come in is they want to be successful. ‘That’s refreshing when you come in as a senior player. ‘There will be times in the season when you are in the dressing room and trying to make things go right.